This step-by-step guide describes how you can add a second wireless router to your existing home network and extend the range of the Wi-Fi signal. The router will work as a Wireless Access Point. The wireless range offered by your router will vary depending on which Wi-Fi standard it supports – is it 802.11g or 802.11n compatible? – and whether there are any walls around as that will obstruct the Wi-Fi signal. The 802.11n routers, also known as Wireless N routers, typically have a higher Wi-Fi range but even if you get one of these, the wireless signals may still not reach certain areas of your home – like the corner study or the bedroom on the first floor – as there are just too many obstructions in the form of walls between your laptop and the router. What should you therefore do to ensure that the Wi-Fi signals are available in full strength in every corner of your house? You can easily extend your Wi-Fi network with some additional hardware – like Wi-Fi repeaters and Wireless Access Points – but if you want to save a few bucks, just get hold of an old wireless router that you no longer use and connect it to your existing router using an inexpensive Ethernet cable. Our premises is around 100 feet by 200 feet with plenty of walls (see the above illustration) and yet there’s wireless Internet access available in almost every part of the house. The setup is extremely simple. All I have is a main Wireless-N router connected to the ISP provide modem. Then there’s a second wireless router (Wireless-G) that is connected to the main router over an Ethernet or Cat-5 cable. Let’s call our routers OBAMA (the router that you are already using with your wireless home network) and PALIN (the second router that you want to add to increase your wireless range). Step 1: First we need to determine the IP address of OBAMA (our existing router). Copy-paste the following command in the Windows Run box and note the value of “Default Gateway.” That your router’s IP address. Let’s assume the router’s IP address is 192.168.30.1. Also make note of the Subnet Mask value which is usually 255.255.255.0. Step 2: Open your web browser and type the router’s IP address, that you determined earlier, into the address bar. If you are using IE, you might want to add http:// to the address else IE may throw an error. You’ll now have to provide a password for accessing the router settings. This will vary depending on your router’s manufacturer – just Google for “<brand name> default router password” or try the standard combinations like admin/admin, admin/password and admin/<blank> (no password). Step 3: Once you are in the settings of OBAMA router, switch to wireless settings and make a note of the Wireless mode, the SSID and the channel. If you have protected your Wi-Fi with a password, also note down the security mode used (WPA, WEP or WPA2) and your secret passphrase. Step 4: Next we need to configure PALIN, our second router. First reset the router PALIN to factory defaults by hard-pressing the reset button for about 10 seconds. Now connect PALIN to your computer using the Ethernet cable. Put one end of the cable in any of the LAN ports available on the router and the other end to your computer’s Ethernet port. Make sure the router is powered on. Step 5: Open the browser and type 192.168.1.1 – the default internet IP address of your PALIN router. If you are not using a Linksys router, try 192.168.0.1 which is the default for Netgear and D-Link routers. Once you are in, you need to change the values of the default SSID, Wireless mode, the channel, the security mode and the passphrase such that they match with your OBAMA router. Then go to Setup –> Advanced routing and change the current mode from Gateway to Router. Next disable DHCP Server since our primary OBAMA router will handle the task of assigning IP addresses to devices connecting to the wireless network. Finally, change the IP address of the PALIN router to any free address in your LAN. 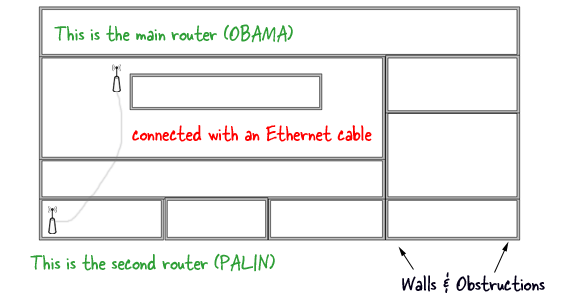 For instance, if the IP address of OBAMA router is 192.168.30.1, you can safely assign 192.168.30.2 to PALIN. Also make sure that the Subnet mask is the same as determined in Step 1. Save settings. Now that we have configured the routers, it’s time to connect them with wires. Your existing OBAMA Router probably has five (1+4) ports – the WAN port here (or the Internet port) should be connected to the ISP provide modem as before. Pick any of the available LAN ports on the router and connect it to any of the LAN ports on the PALIN router using an Ethernet cable. That’s it. Now that everything is setup, you can connect your computer and mobile devices to the second router using either a wired connection (the three ports are still free) or over Wi-Fi. Since we have assigned the same SSID and security settings to the second router, you don’t have to configure anything on your laptop as you move around the house*. Also, as we are just expanding the reach of an existing wireless network and not creating a new one, all your shared folders, music libraries, photos, and other files will be accessible from all computers and mobile devices that are connected to the home network. [*] You may also split your existing wireless network by connecting a router. This method will create an additional wireless network and the two won’t be able to see or talk to each other.